Scrub Bird filmed for the first time, plus other rare rainforest birds and animals. An incredible journey through the rugged McPherson Ranges from the ancient Antarctic Beech Forest to the vibrant Sub-Tropical Rainforest. Naturalist photographer Glen Threlfo has spent years seeking these rare creatures learning their habits and finally capturing them on film. 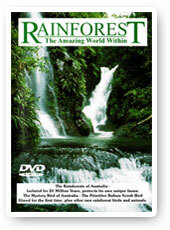 You’ll be spellbound as you observe rare footage of the beautiful Rose Crowned Pigeon, the elusive Cat Bird, rainforest Possums and Pademelons (small Kangaroos), beautifully filmed and explained. This is the FIRST Definitive look at Australia’s unique Rainforest.